Many media outlets turn to Oasis Design for original, accurate content. We work on this stuff because we believe in it, and the more widely distributed the information the better. If you are crafting a piece and think we might have some text or graphics which could benefit your project, please Email us . Depending on the outlet and how much work we have to do, our images and text may be used with a moderate charge, or, especially if we don't have to modify the material, nothing more than a credit (e.g., "this material used with permission from Oasis Design, oasisdesign.net"). Our material has been used in scores of articles and books. At times our information has been reproduced without critical context or qualifiers so that it could lead people to build something wrong. We prefer to have the opportunity to check articles featuring our material for technical accuracy. Many publications have asked us to check other writing for technical accuracy and this is now a service we offer as well. 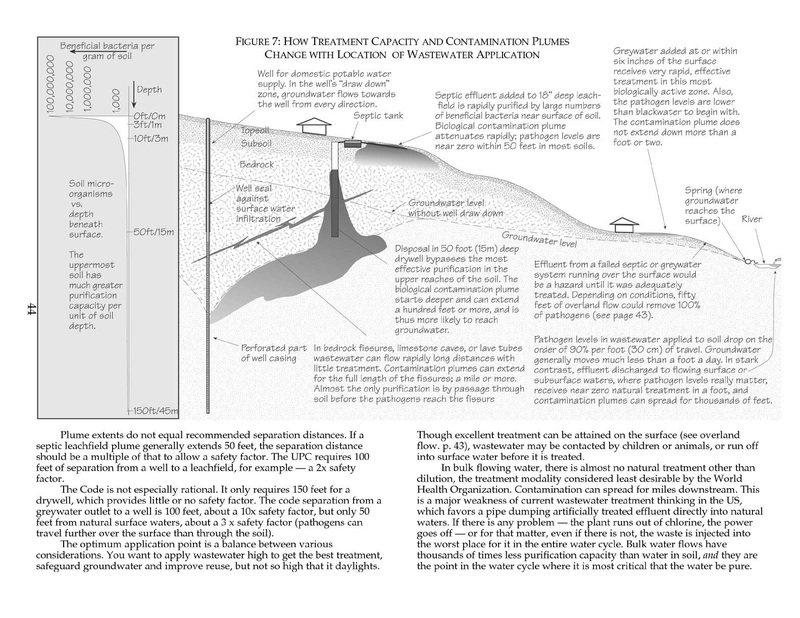 "The Dirty Water Underground" 31 May 2007, article in The New York Times. Read it online here. The Carbon-Free Home: 36 Remodeling Projects to Help Kick the Fossil-Fuel Habit. Stephen and Rebekah Hren. pp. 172-178. 2008. Chelsea Green Publishing Company, White River Junction, VT.
Natural Remodeling for the Not-So-Green House: Bringing Your Home into Harmony with Nature. Carol Venolia and Kelly Lerner. pp. 82-83. 2006. Lark Books, Ashville, NC. The Septic System Owner's Manual. Lloyd Kahn, Blair Allen, and Julie Jones. pp. 64-71. 2000. Shelter Publications, Inc., Bolinas, CA. The Natural House: A Complete Guide to Healthy, Energy-Efficient, Environmental Homes. Daniel D. Chiras. pp. 331-337. 2000. Chelsea Green Publishing Company, White River Junction, VT.
"...Ludwig's work takes an inherently practical and responsible approach to water reuse, and is at the absolute cutting edge of appropriate technology". The Downloadable copy & graphics page and the product detail pages (accessible through Books & articles) has high resolution images of the covers.